Your TrustWellness program provides tools, resources, and programs to help you live a healthier life. This includes annual Challenges that focus on three primary areas of health: increased physical activity, better nutrition, and stress management. They are designed to educate and motivate participants to incorporate healthy behaviors in your everyday routine. Below you will find information about all Challenges and requirements for participation. 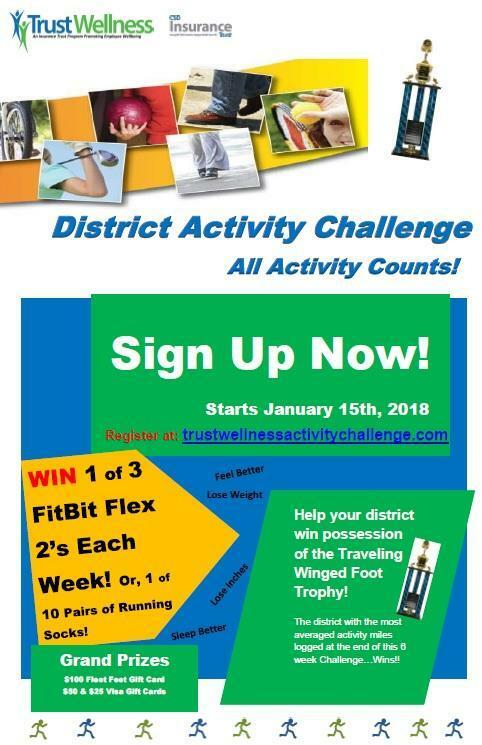 Here’s How It Works: The district with the most activity miles (averaged) logged at the end of this 6 week Challenge, wins possession of the traveling Winged Foot Trophy along with bragging rights! Total miles are based on the average of all district participants each week during the 6 week Challenge, this allows smaller districts to compete with the larger districts. Note: each district must have a minimum of 5% of district member population registered in order to win. Each week a drawing will be conducted for participants that log their activity to win prizes. Who Can Participate: All district employees are eligible to participate and log your activity. However, you must be enrolled in the school’s medical plan to be eligible for prizes. How To Participate: Register at: trustwellnessactivitychallenge.com Click on “Register” if you have not participated in the past, or “Sign In” if you have. NOTE: You can register to participate at any time during the Challenge and still be eligible for prizes. Disclosure: By registering to participate in the TrustWellness District Activity Challenge you agree to allow the CSD Insurance Trust’s TrustWellness Program to photograph, videotape, and use your name, and to use such media for any and all purposes including advertising, print publications, public relations displays, posters, and promotional displays in public venues. There is no financial compensation for the use of the media. It is understood that this consent remains valid until I withdraw my consent in writing and I hereby release The CSD Insurance Trust from any and all claims that may arise out of the use of such media. See our TrustWellness Program Notice at csdinsurancetrust.com. This 3 week Challenge is designed to answer questions about health, nutrition, available resources and tools to help you stay focused on healthy habits this holiday season, and a chance to win prizes!! 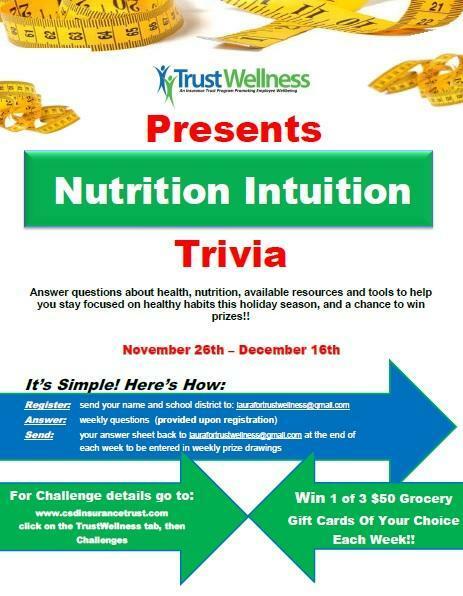 Finally, send your answer sheet back to laurafortrustwellness@gmail.com at the end of each week to be entered in weekly prize drawings to win 1 of 3 $50 gift cards to the grocery store of your choice! It's that simple! Who: All members of the CSD Insurance Trust are eligible to participate and win prizes. If you are not a member you are welcome to participate, however, non-members are not eligible to win prizes. Sorry. 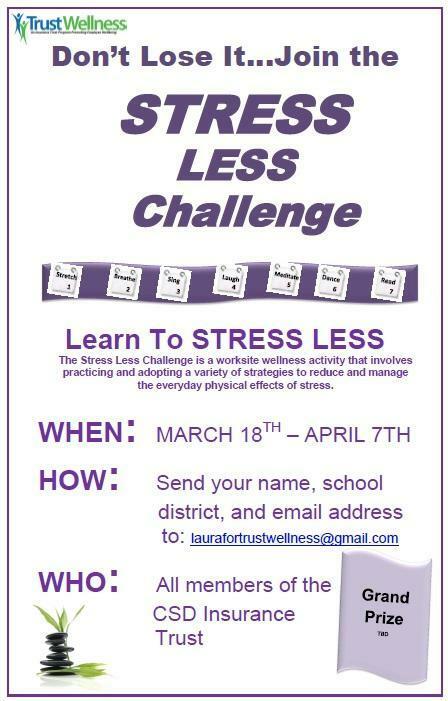 The TrustWellness Stress Less Personal Challenge is a stress management initiative. It provides participants the opportunity to practice and adopt a variety of simple daily activities that you can do anytime, anywhere to address the physical effects of stress. This is a three week activity, April 8th thru April 28th, 2019, where participants earn points for practicing stress relieving techniques for a minimum of 10 minutes each day . Stress reducing activities can include more than one, but should equal at least 10 minutes. Use activities from the list provided to you upon registration, or, use your own (each activity is worth 1 point). At the end of each week send a copy of the Challenge Log to: laurafortrustwellness@gmail.com to be eligible for the weekly prize drawing. All staff are eligible to participate in the Challenge, however, only members of the CSD Insurance Trust are eligible for prizes.